A Belgian man, whose east Belfast home was attacked, believes he was targeted because of his accent. Mark suffered minor head and arm injuries after a brick was thrown through the front window of the house in Wayland Street on Tuesday night. He works in the community, helping elderly and disabled people, and he said he "adds something to society". "I'm so embraced by my clients that an incident like this just rocks my world," he told the BBC. The PSNI has said it is treating the incident as a hate crime. The attack comes less than a fortnight after cars were burned out in the same street, forcing a mixed-race family to move out of the area. Mark, who works in the community for a Christian social enterprise, told BBC Radio Ulster's Talkback programme he was about to go to bed when the attack occurred. "I was about to turn the TV off and all of a sudden a brick - half the size of a breezeblock - flew through my window," he said. "I was scared to death. I saw damage on the floor, started bleeding from the head, started shaking glass from my hair and it just kept coming and coming. "I didn't sleep at all - that brick could have killed me, the size and weight of it." Image caption Mark has a message for those responsible: "Get to know us better and see what we add, instead of what they think we take away." Mark, who did not want to use his surname, came to Northern Ireland in 2006. He said the majority of people had been welcoming and he was upset that someone would target him because of his nationality. "I can't believe some people are willing to do that to foreigners," he said. "I am employed by a local charity here, I help elderly and disabled people. I add something to society and it's so weird to be targeted for being a foreigner while I contribute so much to society. "It just keeps going through my mind - I'm so embraced by my clients that an incident like this just rocks my world." 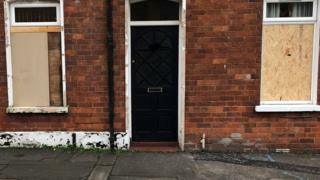 Mark told the BBC he did not think he can stay in his current home and he was looking for somewhere else to live - but he does not want to leave Northern Ireland. He has a message for those behind the attack. "I want them to know what we contribute to society and instead of repelling us, try to embrace us - get to know us better and see what we add, instead of what they think we take away," he added. "I've travelled the world, some people haven't and they're not used to different cultures or different ways of life. "People have prejudices. It's not up to me to condemn people with prejudices, I just try to educate them to see who I am, what I am." You can listen to this interview in full on BBC Radio Ulster's Talkback programme on Thursday 2 November from 12:00 GMT.